PYONGYANG, North Korea - Sept. 20, 2016 - PRLog -- Tom Bodkin, director of Secret Compass, said, "Planning for our 2016 expedition is now complete and the 12-strong team will assemble in Beijing over the weekend, ready to begin their pioneering exploration of this notoriously secretive state. "Our adventurous travellers aim to get beyond North Korea's headlines. They will experience the reality of life in rural and urban North Korea in a way out of reach to those bussed around on whistle-stop tours." Kerry O'Neill, communications director with Secret Compass, said, "The team will necessarily be accompanied by a government guide and will follow the prescribed visits to the country's monumental architecture. "Secret Compass will approach the rest of the endeavour in its self-reliant expeditionary manner, sending out a leader with full communications and medical kits as the team heads into the more demanding mountain regions." Though there is still debate on this issue – as with Burma/Myanmar – tourism has been touted as a force for good in North Korea. Those employed in the trade get to meet outsiders and to practice their foreign languages, while getting a glimpse of the outside world. In a country with strict media restrictions, interaction with tourists can be a key channel for getting news to the outside world, from within this secret state. With its military background, Secret Compass is known for its exploratory expeditions to countries or regions avoided by many due to their remoteness, post-conflict reputations or inaccessibility. Secret Compass welcomes applications for the 2017 North Korea team from anyone with a good level of fitness who's keen to achieve the extraordinary in the world's wildest places. North Korea joins other 2017 Secret Compass destinations including Afghanistan, Armenia, Bhutan, Burma, Ethiopia, Gabon, Iran, Kurdistan, Kyrgyzstan, Madagascar, Panama, Siberia, Mongolia, Siberia, the Democratic Republic of the Congo (DRC), Chad and southern Sinai. 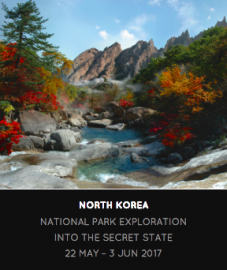 To join the 'North Korea: Into the Secret State' team, visit secretcompass.com/expeditions in the first instance to find fuller information and links to the online application form. For further information, contact Secret Compass communications director Kerry O'Neill via email or by telephone, +44 (0)207 096 8428. Secret Compass redefines what is possible by creating pioneering projects in the world's wildest places. It's built around a team of trusted experts who combine a passion for exploration with industry-leading professionalism. Secret Compass reignites your primal need for adventure, providing the catalyst for you to come alive and achieve the extraordinary.